Ten years after it ceased taking data at Brookhaven, the muon g-2 storage ring embarks on a cross-country journey from the woods of Long Island to the plains near Chicago, where scientists at Fermilab will re-fill its storage ring with muons created at Fermilab’s Antiproton Source. 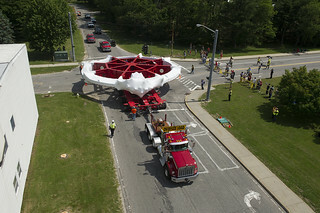 While most of the machine can be disassembled and brought to Fermilab in trucks, the massive electromagnet must be transported in one piece. It cannot tilt or twist more than a few degrees, or the complex wiring inside will be irreparably damaged. The Muon g-2 team devised a plan to make the 3,200-mile journey that involves loading the ring onto a specially prepared barge and bringing it down the East Coast, around the tip of Florida and up the Mississippi River to Illinois.